Ericsson (NASDAQ: ERIC) is supporting Solar Team Eindhoven in the World Solar Challenge with an in-built application based on the Ericsson Connected Traffic Cloud. The application, called Solar Navigator, brings economic driving to the next level. By collecting current weather data and traffic data, Solar Navigator gives suggestions for the optimal route, which will facilitate better decisions regarding the speed of the car during the race and the charging level of the batteries. The World Solar Challenge is the ultimate race for solar-powered vehicles and encourages teams to push the limits of technology. This year, 46 teams from 25 countries will take the epic 3,000-kilometre journey across the Australian outback. 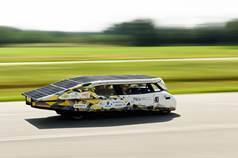 Solar Team Eindhoven - a multidisciplinary team of 21 students from Eindhoven University of Technology in the Netherlands - will compete with Stella Lux, an energy-positive four-seat family car. Liselotte Kockelkoren, Mechanical Engineering, Solar Team Eindhoven, says: "The Solar Navigator application gives us access to very accurate weather data. In this way, we have up-to-date information and data available for an accurate strategy to determine our speed." Furthermore the 'Solar Navigator' in Stella Lux contains several futuristic features which shed a new light on driving your car. Solar Navigator could be the next level navigation: a system which gives suggestions for the optimal routes, using the most accurate weather predictions, real-time traffic conditions, synchronizing with your agenda, knowing whether electric charging is required and how much energy can be discharged to your household by the end of the day. Stella Lux is the only car in the World Solar Challenge with a built-in application and with the possibility to give energy back to the grid. Tom Selten, Team Manager, Solar Team Eindhoven, says: "Efficiency will be more important than ever this year, as competitors in the Cruiser Class will only be able to recharge once, compared with three times in 2013. Ericsson's application gives us a great advantage, despite the new rules. It enables us to optimize our route and to minimize braking and acceleration to conserve energy, therefore increasing our chances of once again winning the World Solar Challenge." The Ericsson application is based on the Connected Traffic Cloud, a managed cloud platform that enables two-way sharing of data between connected vehicles and road traffic authorities. For the purposes of the World Solar Challenge, Connected Traffic Cloud will be used to provide a competitive advantage for Solar Team Eindhoven by aggregating car, traffic and weather data, performing in-depth analytics and selecting an optimal route. By minimizing braking and acceleration, Connected Traffic Cloud will help to conserve energy and increase the team's chances of success. Valter D'Avino, Head of Ericsson Region Western & Central Europe, says "This event is all about finding real and sustainable transport solutions. Partnering with Solar Team Eindhoven gives Ericsson a great opportunity to demonstrate the potential of Connected Traffic Cloud and our transport portfolio in general. As the car is solely powered by solar energy, the Solar Navigator provides more accurate forecasts, which can help the students decide how to drive their car more efficiently and improve their chances for winning." Solar Team Eindhoven won the inaugural Cruiser Class of the World Solar Challenge in 2013 - a 3,000 km race from Darwin to Adelaide in Australia - and will aim to retain its title this year.